You have chosen to buy Swan Songs & Sounds From The Treeline (Digital Download). We’ll email your download code here. We’ll mail your Sounds From The Treeline CD here. I want to buy no 1 2 3 4 5 6 7 8 9 10 extra copies to give away. We, the original five members of Lakefield reunited to film a video for “Good Guy”, the single from our new album. We hope you enjoy watching it as much as we enjoyed making it. Help us spread the word by sharing it with a friend! Get your own DRM-free MP3 of this song in exchange for a Tweet or a Facebook Post. Legend has it that the mute swan lives its entire life in silence, until delivering one beautiful performance in the moment before its death. 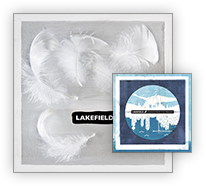 There’s so much sweetness on Lakefield’s debut… Rossiter optimistically sings with her dove’s coo. sheer exuberance and honesty easily win in the end. Sounds From The Treeline expresses a yearning for escape, simplicity, love, and togetherness. Vancouver, hemmed by mountains, ocean, and wilderness, looms like a panacea in the minds of Canadians accustomed to more dominating urban forms and a more punishing climate, and represents a living embodiment of the simultaneous desires for civilization and solitude. Lakefield, composed of Vancouver locals and transplants from Toronto and Edmonton, tells this quintessential Canadian story. From the first cry to the final breath, Lakefield’s story has been a humble one, co-authored by five complicated friends. It’s one well known by anyone who has ever longed to live and love through music: the euphoria of a perfectly executed decrescendo; the long fall on to deaf ears; the big-kid, major-label ambition, radiating energy into the void; the only aspiration being the sound of half breaths hauling heavy hopes up steep steps. Five untenable years, one full length debut album, and more than 25 live performances after Kate Rossiter (Keys, Vocals), Steven Luscher (Guitar, Vocals), Kyle Sulyma (Bass), Bryan Chiu (Guitar), and Paul Teehan (Drums) made their first sound, Lakefield is back to write their final chapter, pull up the covers, and blow out the light. Legend has it that the mute swan lives its entire life in silence, until delivering one beautiful performance in the moment before its death. 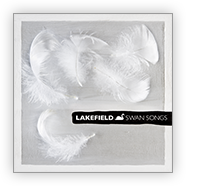 The Swan Songs EP, is Lakefield’s. Produced as a blood promise to each other to remember themselves as they were at the end, it was recorded on two continents, against impossible odds. Drummer Paul Teehan laid the foundation of this tombstone release in London at The Limehouse, their swan pond literally within view of the control room. With help from their most dedicated friends, the remaining members built the release atop those transatlantic recordings, back in the bedrooms and living rooms of Lakefield’s hometown – Vancouver, BC.